A couple of months ago, I began dating a guy who loves Tally Hall, and he introduced me to their music (and the awesomeness of the Tally Hall Internet Show.) After listening to Marvin’s a bazillion times, I’m head over heels for them. (earlier on Saturday, I noticed I had gum on the bottom of my shoe, and the first thought in my head was “I stepped on gum! I stepped on gum! Oh-ho-ho!” ) I got the chance to see them live in concert last night, where my boyfriend introduced me to the band themselves… itself.. theirselves? No, that’s not a word……! We got to Johnny Brenda’s around 7… it’s a venue, it’s a bar, it’s a restaurant. It’s a venubarstaurant. While it was too dark to see my food, my table had lights in it… that not only lit up now and then, but also changed COLOR. So, I was happy enough. We had dinner with Linnea an Greg, (another Tally Hall fan couple), and were soon joined by my boyfriend’s friends, Dan and Hannah. 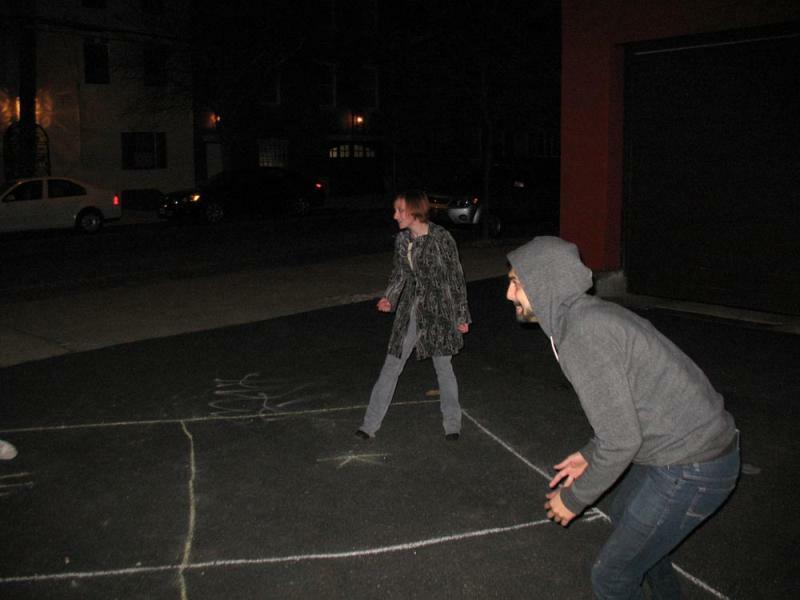 At 8:30pm, we (my boyfriend, Dan, Hannah, and I) ventured out to play four-square with the band… but they weren’t there yet. Since it was cold, we went back inside. Soon after, we ventured out again to check if they were there. 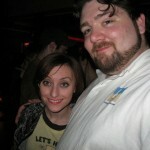 We waited a little longer, and sure enough, there’s a group of people including Rob, Zubin, and Casey Shea. 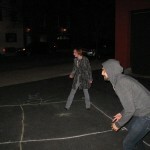 And I think Ross was there too, but I think he decided to head inside rather than play four-square. “You guys here to play some four-square?” Rob asked. “Ok!” we replied, or something along those lines, and headed over to a corner to play. They also brought a present for Coz, a cracked drumhead they’d been saving to give him. Aww! I mainly wanted to just watch the game, but Rob insisted I play, so Zubin taught me the rules and I awkwardly fumbled my way through a round. After I got out, I hung out along the side to make sure the ball didn’t go into the street. It was really cold, so Rob and Coz decided to move their conversation inside, and I followed suit along with Dan. A little later, we ventured upstairs to see the show. It was AWESOME! 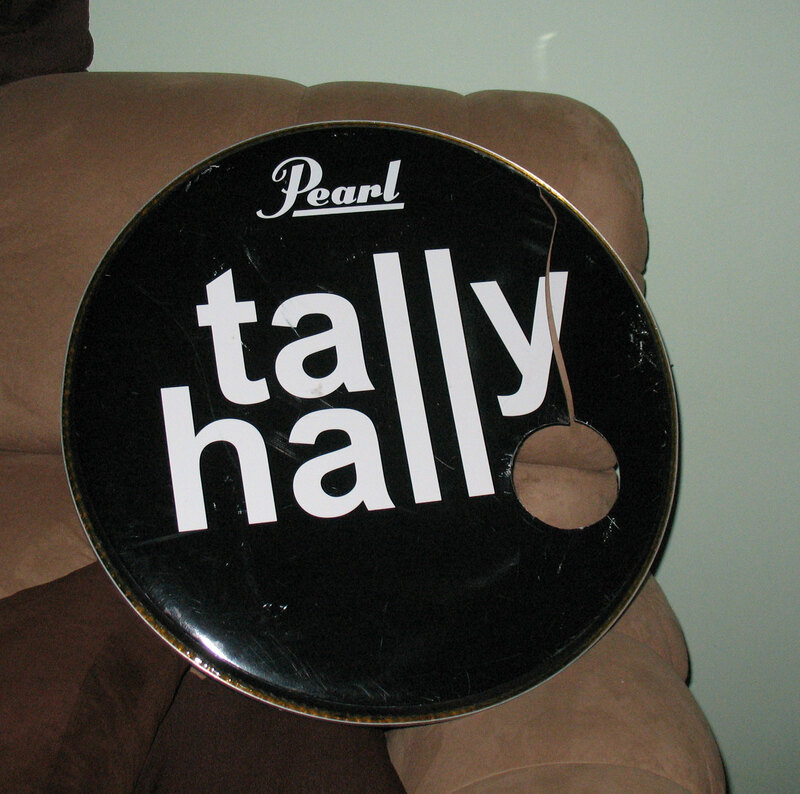 Tally Hall is definitely a band that sounds just as amazing live as they do in their studio recordings, and even more fun. I was also impressed with Casey’s ability to sing the bridge to Ruler of Everything… I dunno, I just felt like that had to be a little tough to pick up. 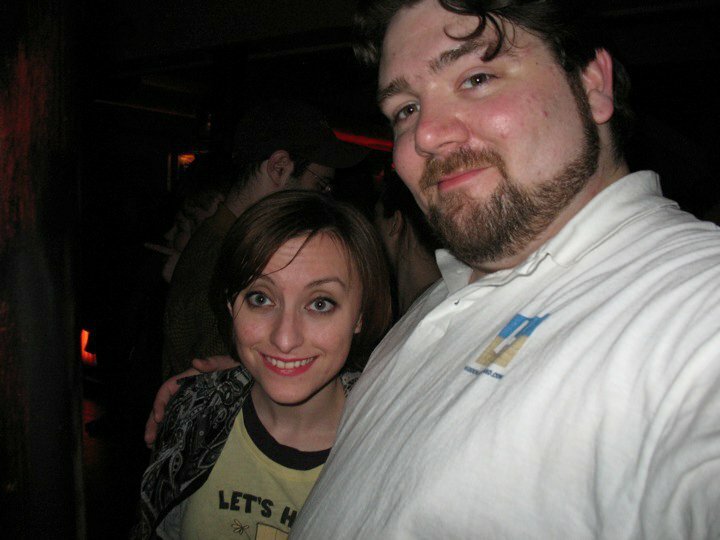 I had a great time, despite some guy screaming extremely loudly behind me; he wouldn’t have bothered me so much had I not been able to feel his breath on the back of my head ::shudders:: Afterward, we chatted with Rob some more, and then went outside, where we caught up with Ross. Andrew had to jet, but he still stopped to say hi, which was awesome. We talked a little more to Rob, Zubin, Ross, and Casey, who graciously recorded a happy birthday message for Dan’s friend Heather, and then we said our goodbyes. The guys were so funny and nice, and I had an amazing time! All photos from this concert are up in HITS Galleries! I'm an unemployed scientific illustrator fresh out of college who, while writing this, suddenly saw that Sylvester Stallone has really strangely shaped ears. This seems like the best thing.